What is an Indiana Eviction Notice? Indiana Eviction Notice: What Is It? An Indiana eviction notice is a document that landlords are legally required to serve on the tenant if they want the tenant to correct a lease violation or vacate the property. It is also known as a notice to quit. Indiana eviction notices must comply with Landlord-Tenant Relations, Title 32, Article 31. What Are the Components of an Indiana Eviction Notice? The legal name of the tenant(s) required to abide by the lease terms. This is the individual or individuals who signed the lease. The address of the rental property, including the city, zip code, and the county. The date that the lease agreement was originally signed. A statement explaining that the tenant has violated the terms of the lease. The reason why the eviction notice is being issued. How many days the tenant has to correct the issue or vacate the property. The name and contact information of the landlord. A completed certificate of service that lists the date of service, on whom the notice was served, how the notice was served, and the signature of the person who effected service. You may choose to serve the tenant in person, serve another adult who lives in the unit, or post the notice to the door. If you serve someone in person, you must explain the contents of the document according to Indiana Code 32-31-1-9. A 10-day notice to quit for non-payment of rent is used when the tenant does not pay their rent on time. It places the tenant on notice and gives them 10 days to pay their rent or vacate the property. This notice should include the full amount due, how it should be paid, and when it should be paid. The notice must conform with Indiana Code 32-31-1-6. Indiana landlords are not required by law to provide an eviction notice to a tenant who is destroying the property. This is known as committing waste. If this happens, the landlord may file an eviction lawsuit with the court immediately. A 30-day notice for month-to-month tenancy isn’t an eviction notice. However, it does end a month-to-month lease agreement. It gives the tenant 30 days to find new housing. 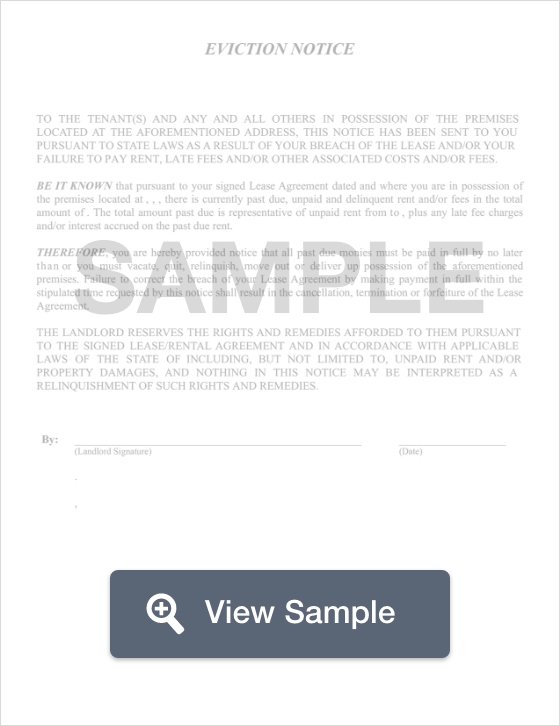 The letter should list the date by which the tenant should vacate the property. This notice should conform with Indiana Code 32-31-1-1. What Are the Legal Considerations of an Indiana Eviction Notice? In Indiana, the landlord may not begin an eviction lawsuit against the tenant without first serving the tenant with an eviction notice. There is an exception to this. If there is damage to the property (known as waste), the landlord may immediately file the lawsuit without serving the tenant with an eviction notice. Eviction notices for failure to pay rent must include the amount of money that is owed. It also gives the tenant 10 days to catch up the rent or vacate the property. The notice must be signed by the landlord or the landlord’s agent. The eviction notice must be legally served as explained above. Landlords in Indiana must serve an eviction notice (with the exception of waste) before they begin a lawsuit. This is important because the landlord must have a court order before they proceed to change the locks, turn off the utilities, or remove the belongings of the tenant. Doing any of those things before the court order is issued is illegal. It is also illegal to evict a tenant for reporting the property for code violations or because of the tenant’s race, color, national origin, religion, gender, family status, disability, or a service dog (including therapy or support pets). The most common eviction notice issued in Indiana is for non-payment of rent. If you’re served with an eviction notice, read it carefully. It should list the amount that is past due and the date by which you must pay it or vacate the property. You must be served with an eviction notice before the landlord can sue you (unless you’ve damaged their property; if that happens, the landlord does not have to serve you with an eviction notice before suing you). For questions about the eviction notice you’ve received, you can call the landlord. Do your best to stay calm during the conversation. We’ve given information about illegal eviction notices under Legal Considerations. If you believe that the landlord is illegally evicting you, you have a few options. First, you can make an appointment with a landlord-tenant lawyer. If it turns out that you do have a case for an illegal eviction, the lawyer can inform you of your options. They can also answer any questions you have about the eviction process. Second, you can contact a law school near you. They may have a legal clinic that can help you. Legal clinics allow third-year law students the chance to gain experience while they are supervised by licensed attorneys. They often help tenants who are involved in evictions for free or for a low fee. Third, check with a legal aid office. Legal aid offices provide low cost or free legal help to those who meet certain qualifications. Many also have helpful information for tenants. In Indiana, landlords must serve an eviction notice for non-payment of rent. The notice must give the tenant ten days to pay the rent or vacate the property. If the notice isn’t properly served, this can hurt the landlord’s chance of success in regaining possession of the property. If the tenant has damaged the property, landlords are not required to serve an eviction notice before filing a lawsuit. If a landlord engages in “self-help” eviction as described under Legal Considerations or in other illegal evictions, they could become the defendant of a very expensive lawsuit. If you’re a landlord and you have questions about landlord-tenant law, your rights, or your obligations as a landlord, talk with a qualified lawyer.